Your company could be doing better. The stock is in the doldrums, and the price-to-book ratio is low. On a variety of financial measures — shareholder returns, revenue growth, operational costs, and so on — the company is underperforming its peers. Cash flow is reasonably healthy, but one of the divisions is starting to falter. Adding insult to injury, management won the last say-on-pay vote by less than a large margin. Last year, activists found a record number of places to invest in. FactSet’s sharkrepellent.net tallied 355 campaigns, with 127 resulting in at least one board seat gained for the activist. Ernst & Young counted 516 activist encounters last year, up 24% from 416 in 2014. And the targets are getting bigger, with megacap companies like DuPont, Procter & Gamble, Apple, and AIG coming into activists’ crosshairs. Descendants of (or in some cases, holdovers from) the corporate raiders of the 1980s, today’s most prominent activists — investors like Carl Icahn, Nelson Peltz, Bill Ackman, and Daniel Loeb — are rock stars on Wall Street. More collaborative in tone than confrontational, current activists are winning fans among traditional institutional investors. The Wall Street Journal reported that more than half of activist campaigns in 2015 were launched by “reluctavists,” normally passive investors who were goaded into activism by poor corporate performance. “We may continue to see ‘reluctavists’ play a significant role in campaigns,” says Richard Grossman, a partner in the M&A practice at Skadden, Arps, Slate, Meagher & Flom who frequently advises firms in response to activist situations. As activism goes mainstream, company size is no protection. A fund that holds a few percent of a target’s stock potentially has an unlimited amount of financial clout, “because if I can convince the big, traditional institutional investors to support me, I have all the investment money in the world at my disposal,” says Shyam Gidumal, a principal at Ernst & Young who advises clients on shareholder activism. That doesn’t mean they’re singing “Kumbaya.” Activists may be openly adversarial, while CFOs may scoff at proposals to drain the corporate cash coffers or slash research and development spending. Moreover, “there are any number of activists whose ideas don’t make sense,” points out Gidumal. An activist may be well intentioned but lack crucial information, such as the company’s tax basis. “It can be that the company says we’ve heard that idea before, it’s a bad idea, and here’s why,” says Gidumal. Sometimes companies wait too long to disclose facts to refute an activist’s argument, says Gidumal. He recalls one retailer that sparred with an activist for nearly a year over whether to spin off its real estate holdings, until it finally convinced investors of its case by revealing that the tax costs of the separation would outweigh the deal’s benefits. “Bringing the facts to the table and being crisp in your messaging” enables a company to resolve an activist encounter quickly, and puts the activist in a better position to exit, says Gidumal. He says that for every activist encounter that becomes public, another one is resolved privately, with no change to the board. Skadden’s Grossman notes that many companies now perform vulnerability self-assessments. “Generally, it’s a good thing,” he says. The self-assessments “are designed ultimately to enhance shareholder value, which is what boards and management teams should be doing.” CFOs, he says, play “a major role, if not the lead role” in vulnerability self-assessments, since such scrutiny typically focuses on financial performance. Meanwhile, companies need to win the hearts and minds of their shareholders — before activists do. “Companies need to talk to their large shareholders year-round, to understand their concerns,” says Brown. “So if an activist does knock on the door, you’re already involved with your shareholder base.” Brown says companies should also get acquainted with the two main proxy advisory firms, Institutional Shareholder Services and Glass Lewis, whose voting recommendations carry considerable weight with large institutional investors. 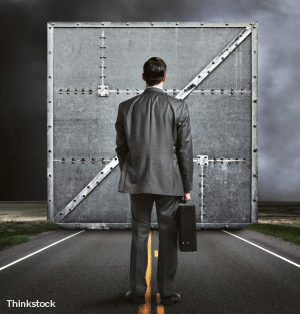 Direct discussions between board members and a company’s largest shareholders can serve as an early warning system of investor unhappiness, and enable directors to communicate management’s strategic vision, says Grossman. Such engagement “is still evolving so that it does not encroach on the traditional role of management communicating with investors,” he adds. “Years ago, it was unusual for directors to meet with shareholders,” notes Evercore’s Anderson, but today it’s common practice among companies in the Fortune 200 to have at least one director designated to do so, he says. The board’s message to shareholders should be more narrative than data dump, recommends Anderson. Instead of assembling “100-page slide decks,” directors should keep it simple, he says, focusing on the five or so yardsticks that are most important to the business and its investors — its margins, cash flow, leverage, and so on — and how the company stacks up against its peers on each. Some companies have effectively preempted demands for shareholder representation on their boards because they have former fund officials on their boards, Anderson points out. Apple, for example, has a founding partner of BlackRock on its board, and General Electric has a former Vanguard CEO on its board. While most activist campaigns continue to address board seats, balance sheets, and break-ups, a fast-growing theme is core operational change — reducing costs, becoming more efficient, increasing returns on invested capital. In 2010, 7% of activist encounters involved operational change, according to EY; last year 25% did. While putting a company up for sale and liquefying the balance sheet are discrete processes, operational change is a longer-term, more invasive proposition, says Gidumal. It can take years, for example, for a large, multidivisional company to reduce its supply chain costs by 500 basis points, he points out. Like other asset classes, activist funds had a tough 2015; Hedge Fund Research’s index of activist funds finished the year up just 1.5%. While HFR’s activist index has outpaced other hedge fund indices, it has trailed the S&P 500 in five of the last eight years. Once activists cash out, how will their targets perform? “The jury is still out,” says Grossman. Despite claims that activist investors are “pumping and dumping,” a recent study of activist interventions between 1994 and 2007 by Harvard Law School professor Lucian Bebchuk and others found that Tobin’s Q and return on assets were consistently higher three, four, and five years following the interventions. Similarly, a McKinsey study of 400 activist campaigns against large U.S. companies found that the median campaign reversed a downward trajectory in target performance, and created a sustained increase in shareholder returns. Such evidence suggests that activist investors frequently advocate sound ways to boost corporate performance and create shareholder value. Which points to the best defense of all against activists: Beat them to the punch. As the coming proxy season will demonstrate, activist hedge funds aren’t the only shareholders taking a greater interest in corporate affairs. “Corporate governance activists are starting to be much more vocal,” says David A. Brown, a partner at law firm Alston & Bird’s Washington, D.C., office. 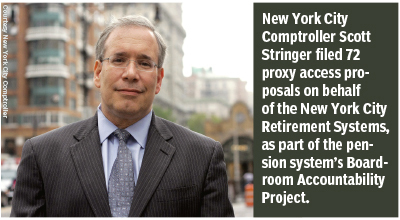 Earlier this year, for example, New York City Comptroller Scott Stringer filed proxy access proposals at 72 companies on behalf of the New York City Retirement Systems, as part of the pension system’s Boardroom Accountability Project. The proposals call on companies to allow investors owning 3% of their stock for three or more years to nominate directors on the companies’ own proxy ballots, instead of having to spend money on their own campaigns. Proxy access was the most-submitted governance proposal in the 2015 proxy season, according to sharkrepellent.net, and will likely be the top such proposal in 2016. Meanwhile, having introduced significant voting policy updates in 2014 and 2015, proxy advisory firm Institutional Shareholder Services continues to focus on equity compensation and pay-for-performance, and will recommend “no” votes on say-on-pay if it determines that a CEO’s compensation is out of line with measures of company performance, such as total shareholder return. And starting in 2017, ISS and proxy adviser Glass Lewis will give a negative recommendation for non-CEO directors who sit on more than five public-company boards. Such directors are currently considered to be “overboarded” if they sit on six such boards. As the rise of activism makes the board’s job more difficult, Brown says the new overboarding policy could make skilled, experienced directors harder to find. Finally, a hardy governance perennial, shareholder proposals calling for an independent chairman, has been trending up over the past four years. But the proposals rarely succeed: of the 63 that came to a vote in 2015, only 2 passed. Of course, activist hedge funds target underperforming companies to make money, not to improve governance practices per se. “A company who’s doing great, whose stock is rising, who has a higher multiple than its peers, but who may have potential governance issues is unlikely to be subject to an activist attack,” says Richard Grossman, a partner at Skadden, Arps, Slate, Meagher & Flom. A fund may use governance issues as a wedge, he notes, “but governance on its own doesn’t typically attract activists, except in extreme cases.” — E.T.